The retina, found in the back of the eye, is a delicate transparent tissue that covers the interior wall of your eye. It converts visual images into signals that are transmitted to your brain. If the retina becomes damaged, these images are blurred. Vision can be lost if damage is severe and treatment does not occur in time. Retinal detachment occurs in one in 10,000 Americans each year. 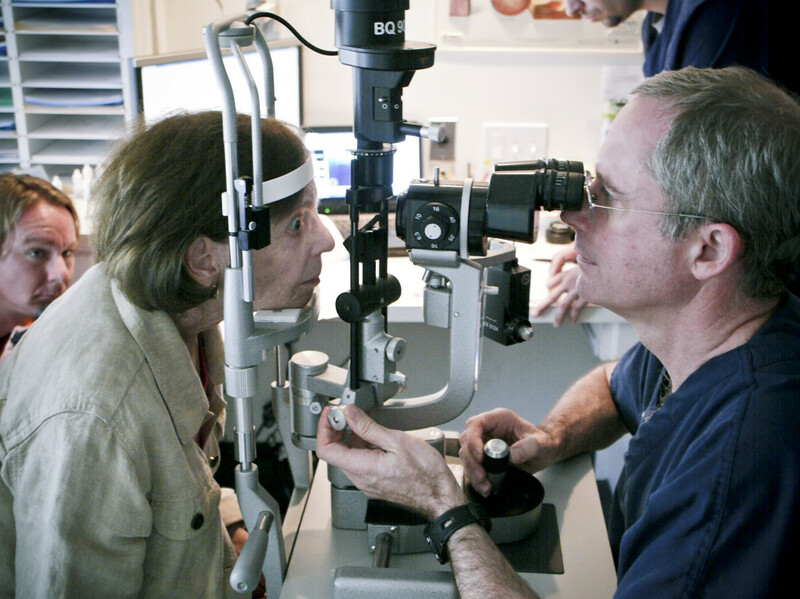 The condition is most typically found in patients who are nearsighted, having undergone previous eye surgery, experienced eye trauma, or who have a family history of retinal of retinal detachments. Middle-aged and older individuals are at higher risk than the younger population. The condition is also more likely to recur in individuals with a previous retinal detachment. 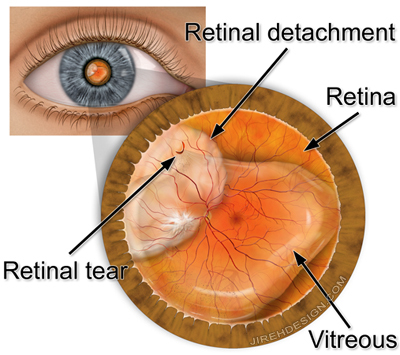 Retinal detachment typically begins with one or more small holes or tears in the retina. These holes are caused by the shrinkage of the vitreous, a clear gel-like body which fills the center of the eye and is attached to the retina. Once a tear has occurred, watery fluid may flow through the tear from the center of the eye causing the retina to detach. The sudden appearance of “floaters” – floating black dots-or brief flashes of light in your vision, may indicate the development of a retinal tear. Flashing lights are best seen in the dark, last a few seconds and usually occur in your peripheral (side) vision.An untreated retinal tear can progress to a detachment. As this occurs, vision is lost in the detached portion of the retina. Some individuals experience the sensation of a veil or curtain coming across their peripheral vision. If it progresses, central vision may be lost and the entire retina may become detached. If left untreated the result may be a total loss of vision in the affected eye. Patients who have floaters, flashes or poor vision should consult with a Retina Health Center physician immediately. Awareness of the symptoms of retinal tears plays a critical part in reducing the potential permanent damage to vision. While the risk tends to increase for retinal tears as people age, people who have undergone cataract surgery, suffered a major blow to the head or injury to the eye are also at risk. Retinal tears are generally treated in our offices, at either the Fort Myers or Naples location, using minimally invasive surgical procedures that require no incisions. Cryopexy (freezing): Like laser treatment, cryopexy stimulates scar formation to seal the edges of a retinal tear. Vision is not usually affected by the retinal tear and new floaters may be seen after treatment. Usually, they will become less noticeable after a few months. Retinal detachment must be repaired surgically. Your Retina Health Center physician will determine which of the three commonly used methods of repair is best for you based on the length of time that the retina has been detached, the severity of the detachment and the location of the tear that caused the detachment. In some instances, a combination of procedures is used. This simple procedure is done in our office on an outpatient basis. It is the preferred method of repair for many simple retinal detachments because it is minimally invasive and usually results in quicker visual recovery than alternative techniques. A local anesthetic is given and the retinal tear is treated with either laser or cryopexy. A gas bubble is injected into the eye and fluid is removed. The bubble then increased in size and presses the retina back against the wall of the eye. The laser or cryopexy therapy holds the retina in place. Two types of gas can be used in this procedure creating a bubble that can either last approximately two weeks or two months, both of which will gradually be replaced by the fluid naturally created by the eye. Visual recovery using this method is gradual and the rate depends on the amount of vision loss in the patient and the type of gas used. Improved vision can begin as soon as within a few hours in some patients and can take up to two months to begin for others. In both cases, vision improvements can continue for six months or more. Although this method is preferred, its success rate is lower than either scleral buckling or vitrectomy. The most common complication is a recurrence of the detachment. If this occurs it can usually be corrected by using one or both of the following procedures. This procedure is performed at a hospital, generally on an outpatient basis, under local anesthesia. An incision is made around the eye and fluid that has collected under the retina may be drained. An elastic band is then placed around the outside of the eyeball bringing the eye wall into contact with the retina. A gas bubble similar to that used in pneumatic retinopexy, may also be used to keep the band in place. Following this procedure vision usually begins to improve within a few weeks; it may take up to six months or more for a full recovery. Glasses may be needed following the surgery as the operation frequently causes nearsightedness. This procedure is generally performed in a hospital, under local anesthesia. During this operation the gel-like material in the middle of the eye (the vitreous) is removed. Accumulated scar tissue, when present, is removed. The vitreous cavity is re-filled with a clear liquid, gas bubble, or other vitreous substitutes. Visual recovery is gradual and is dependent on the gas used and the extent of the procedure performed. In some patients, recovery can begin as soon as a week but may take up as six months or more in other patients. In most cases, retinal detachment can be corrected, but sometimes more than one operation is needed. The length of recovery depends on many factors, including the length of time since the detachment, and can take six months or longer. Successful reattachment is not possible in every case. Factors such as the patient’s age, general health and duration of the problem must be taken into account. Regardless of the ultimate outcome, it is vital to remember that retinal detachments generally do not improve without medical help. Contact Retina Health Center today if you are experiencing symptoms for a retinal tear.